Juan Carlos, the King of Spain, is a serial womanizer who once made a pass at Princess Diana while she was on holiday with Prince Charles, a new book has claimed. “The Solitude of the Queen” by Pilar Eyre also alleges that King Juan Carlos is a “professional seducer” who has had numerous affairs and has not shared a bed with his wife for the past 35 years. The book reveals that age has not stopped King Juan Carlos, 74, with the monarch regularly receiving vitamin injections and anti-ageing treatments. “The Solitude of the Queen”, which is likely to prove controversial in the Catholic country, claims the king made a “tactile” advance to Diana while she and Charles were on holiday in Majorca in the 1980’s. 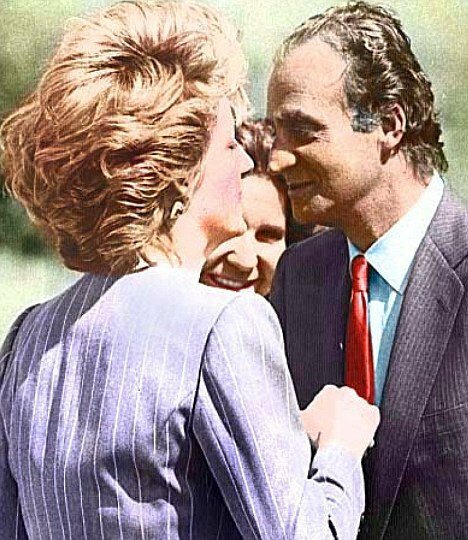 During a 1987 visit, in which Charles and Diana went to Madrid, King Juan Carlos was pictured smiling as he kissed the princess on the hand – a gesture which left Diana looking embarrassed. Pilar Eyre’s book also alleges that Queen Sofia has not slept in the marital bed since 1976 and only remains in the marriage out of “a sense of duty”. The writer even claims the queen stumbled upon her husband with one of his alleged lovers, the Spanish film star Sara Montiel, at a friend’s country house in Toledo in 1976. Queen Sofia, now 73, was forced to attend a football match the day afterwards “as protocol demanded”, before storming out of the Zarzuela Palace, their official residence, with her children. Advised to stay with her husband, Queen Sofia was told a break-up would mean she would “end up being paid to liven up the parties of the newly rich”. After writing the book, Pilar Eyre was informed she would no longer appear on Spanish TV channel Telecinco.